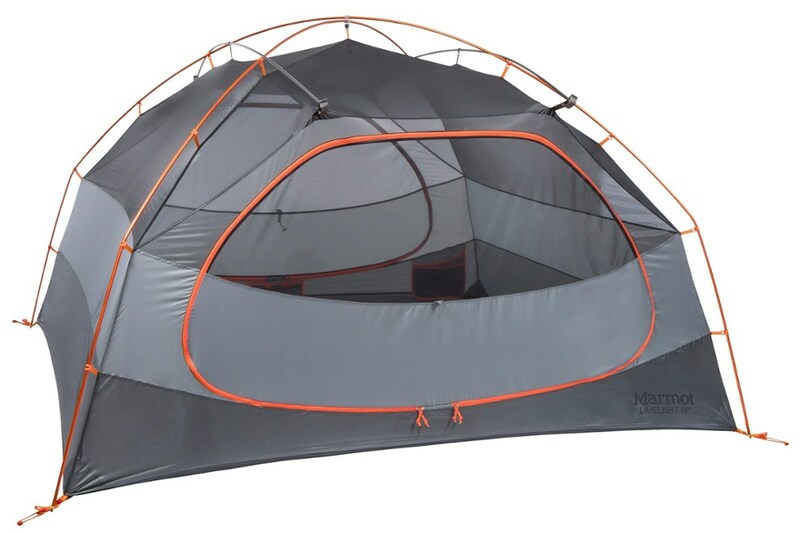 The Mountain Hardwear Optic 2.5 is a massive freestanding dome style backpacking tent that has two adjacent doors (one front and one side) which create a 180–degree panoramic view. 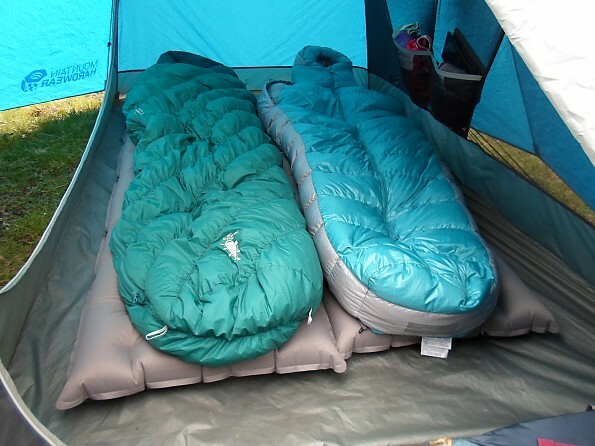 It is categorized as a 2.5 because it can comfortably fit two adults and either a child, dog, extra gear, or even a third person in a pinch. 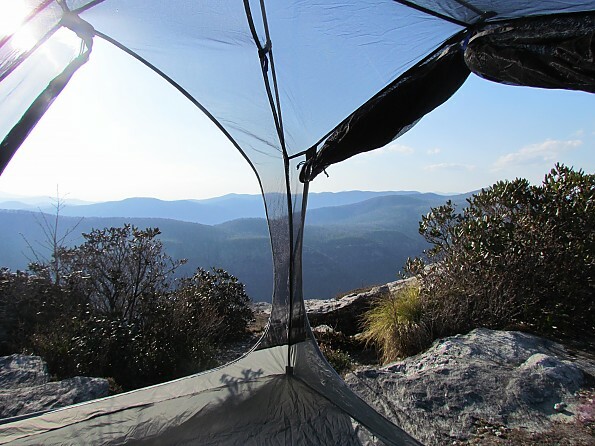 It is heavy for a two-person backpacking tent, but the reward of the cavernous space is well worth it to me. The all new Mountain Hardwear Optic 2.5 has won several awards, including the Backpacker Magazine Editor’s Choice Award and Gear Junkie’s Best in Show Award for the 2013 Summer Outdoor Retailer. 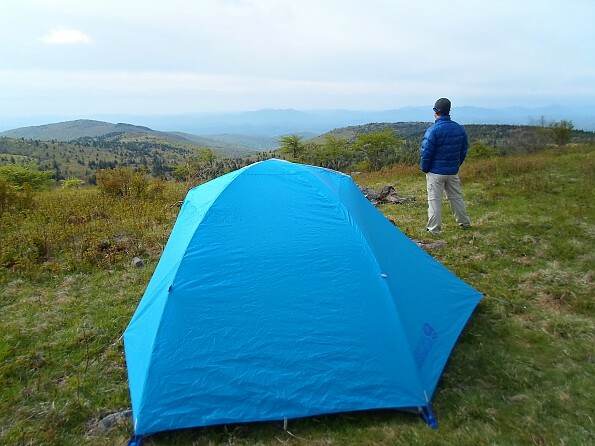 I was very eager to test it out because I am a big fan of spacious backpacking tents. 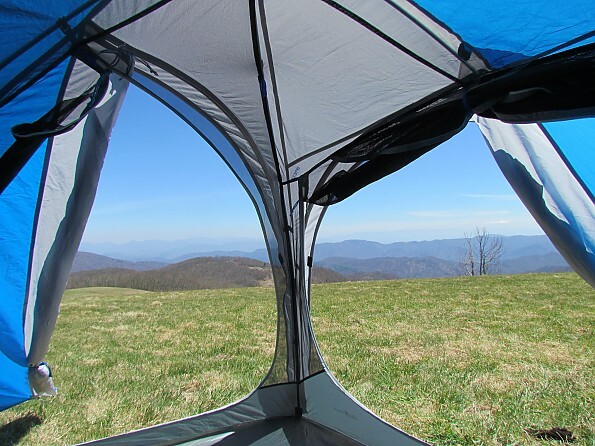 After my testing experience, I can totally see why it has won awards — it is the roomiest 2-person backpacking tent that I have ever seen and it provides some great opportunities for views. My favorite thing about the Optic 2.5 is that it has huge doors, so entry and exit are very easy. 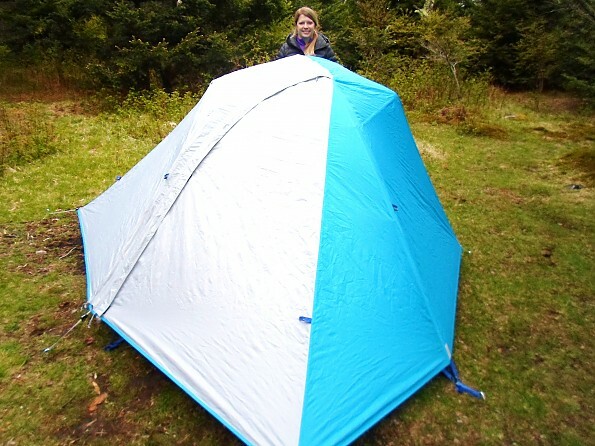 It weighs around six pounds, so this is not a tent that I recommend carrying for just one person. However, if you split the weight with a partner, the weight is definitely worth the sacrifice for the massive amount of space you get. 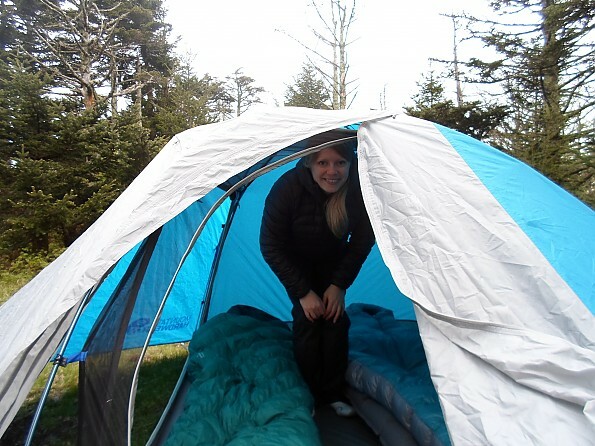 After being so spoiled by this giant tent, I don’t know how I can ever go back to a small backpacking tent. The canopy is comprised of 20D Poly Knit Mesh and has a 70D Nylon Taffeta 3000mm PU Bathtub Floor. The bathtub floor is extra tall to prevent splash back. It is so durable that I do not see the need to use a footprint. 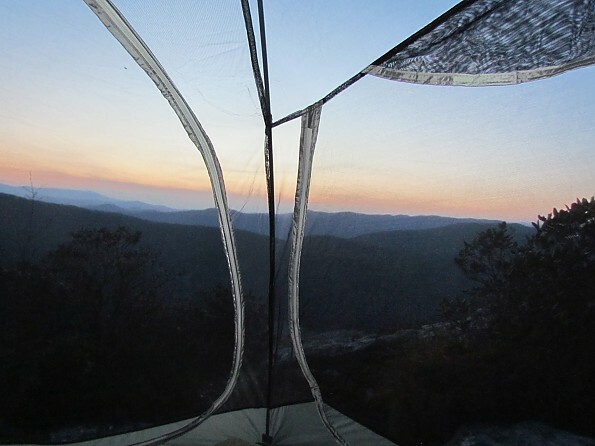 The near vertical walls provide room to comfortably sit up across the whole tent, as opposed to being taller at the head end and shorter at the foot end like most backpacking tents. There are three pockets inside the Optic 2.5. One is located at the top of the side door. I put my tablet in it and watch an episode of pre-loaded TV (usually Parks and Recreation or The Office) before going to sleep. The other two pockets are on the opposite side of the tent, about 1/3 of the way up the wall. They are plenty big enough for a pair of camp shoes, clean clothes, etc. 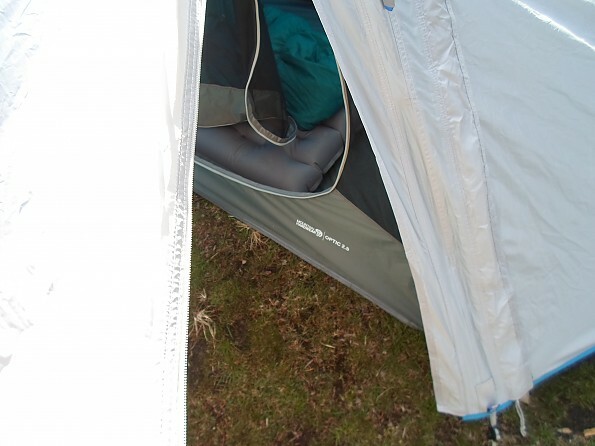 I do wish that the Optic had pockets in the corners of the tent, but the pockets are sufficient in the Optic. The fly is made of 75D Polyester Taffeta and coated with 1500mm PU. It is not very breathable because it lacks external vents. 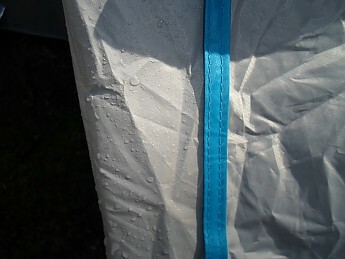 This makes the tent very prone to acquire condensation build up. The body of the fly is blue. The fly’s doors are light gray. This makes set up easy, because the doors are easily identifiable. Here, you can see the three line tensioners that adjust the vestibule height. It also has reflective tabs. 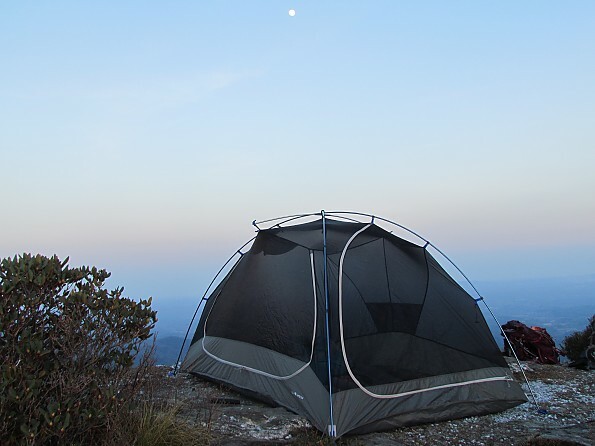 The Optic uses two long DAC Pressfit aluminum poles and one short pole that stabilizes the top of the tent. It comes with 8 fairly lightweight stakes. I found them to be very durable. The Optic has two very generous sized vestibules and doors. 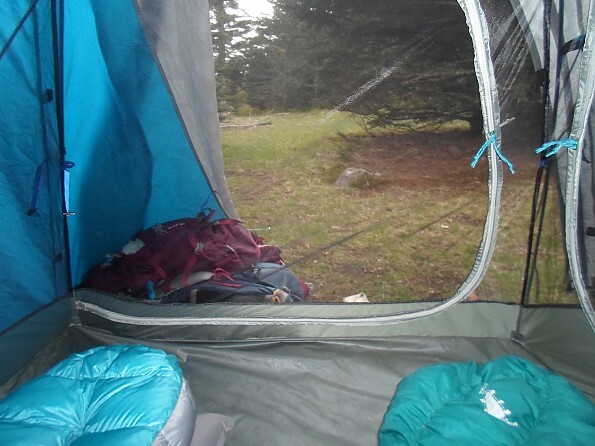 Typical backpacking tents have either one front door or two side doors. 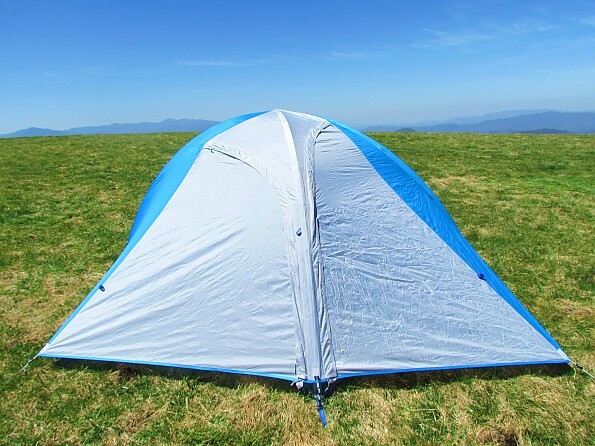 The Optic has one front door and one side door on the right side of the tent. They are placed adjacent to each other to create a 180-degree panoramic view. 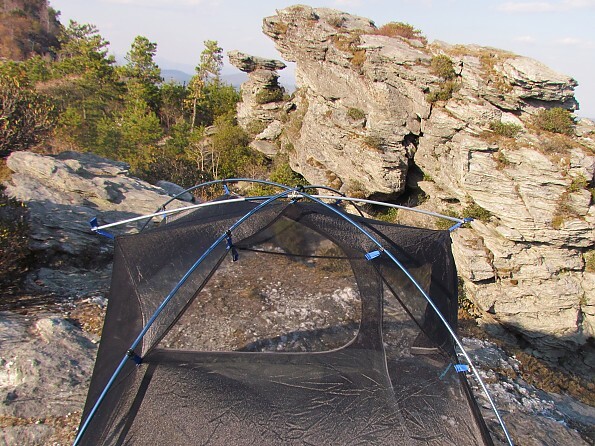 The tent feels larger when the fly is open. 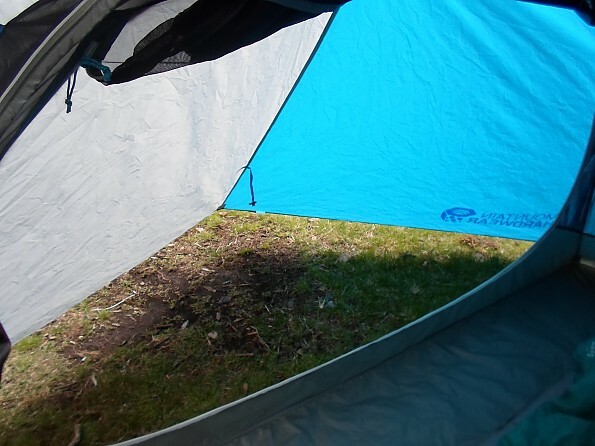 I was interested how the adjacent doors would affect entering and exiting the tent with a tent mate. What I found is that it really isn't a whole lot different than having doors and vestibules on the sides as far as entry and exit goes (except that you would want to make sure that the person by the side door is sleeping with his or her feet towards the front door so the person sleeping by the wall doesn't have to reach over the side door person's head to exit). My only gripe about the doors is that the zippers aren't the smoothest. I often needed two hands to get them going. The front vestibule is on the small side at 6 square feet. It fits two packs and two pairs of shoes/boots and still has room to exit the tent. The side vestibule is 12 square feet. It stretches from the door opening all the way over to the Mountain Hardwear logo on the left. I am a huge fan of this giant vestibule! 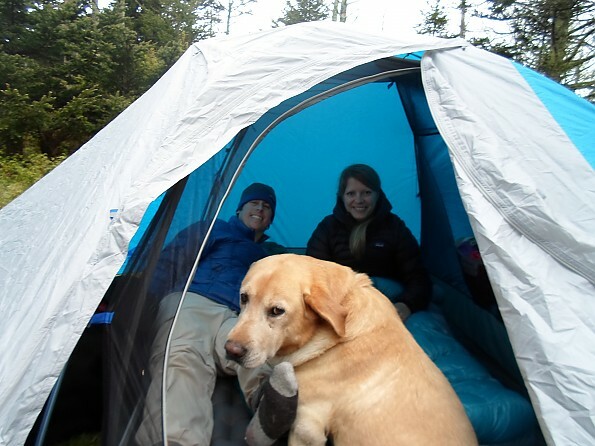 I have a very large lab (100lb +), who refuses to sleep in my REI Half Dome vestibules (8 sq ft each), but he slept all night in the Optic’s 12 square foot vestibule and had plenty of room to spare. If he is happy, I am happy! I've never been able to sleep with both dogs in my tent, so it was really nice to be able to take both of them with me and know that they would be protected from weather. The setup for the Optic is very simple. 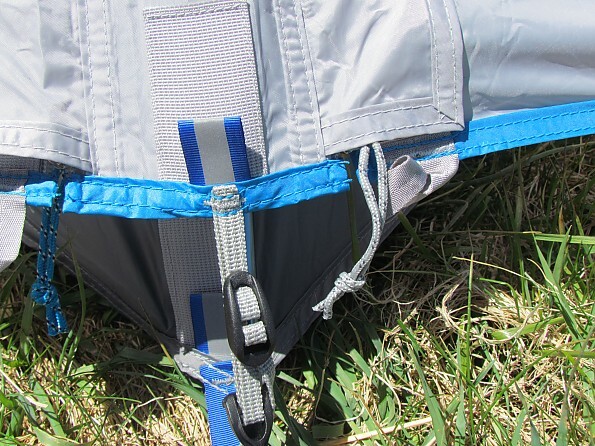 Since it is free-standing, you just cross the long poles, and insert them and the short top pole into the grommets, then clip on the clips and the canopy is set up. The fly is designed to be able to set it up quickly and easily. 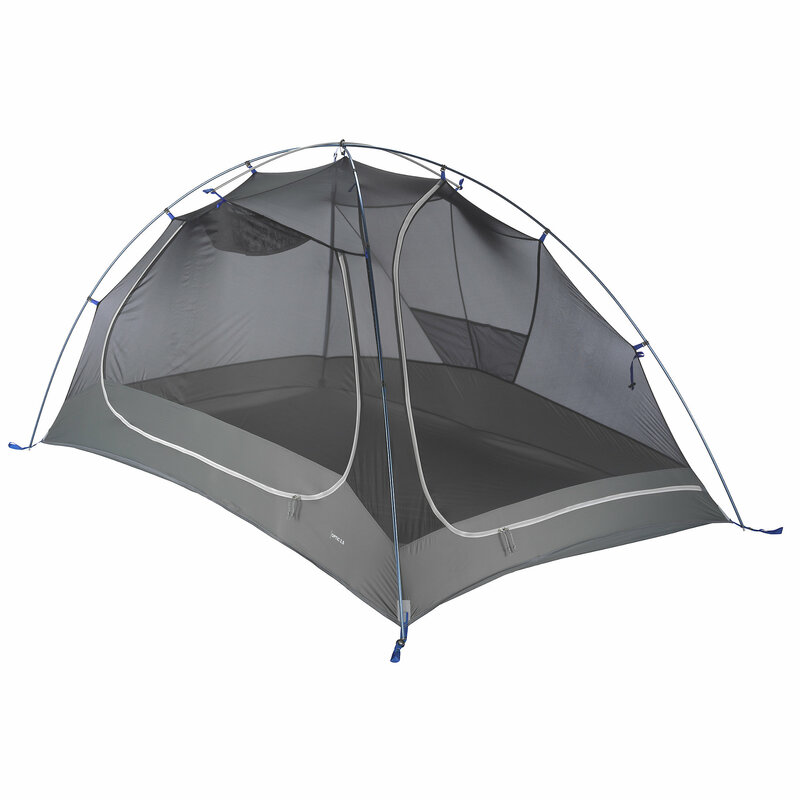 The Optic’s gigantic doors make entering and exiting the tent so easy. 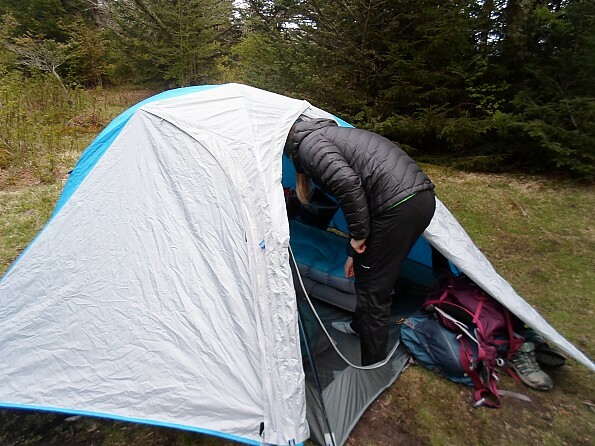 With most backpacking tents, you have to crawl into and out of the doors. With the Optic, you walk in and out of the doors and just have to duck your head. 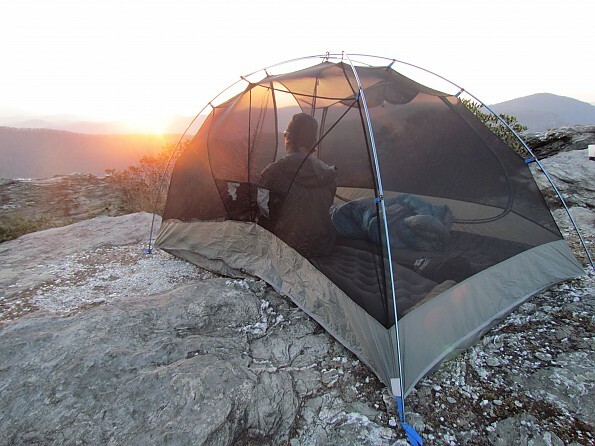 The Optic has the most room of any backpacking tent I’ve ever seen. The head room, length, width, and near vertical walls all through the tent make this tent all but a cabin. It has a 4 foot ceiling that is the same height almost all the way across the top. It has so much room that I could sit down and stretch my arms over my head as high as I could and they still did not touch the ceiling. 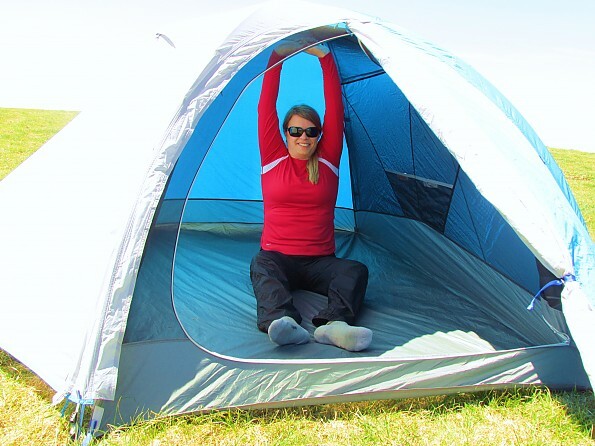 The overall room for me was especially helpful when setting up and packing up camp and changing clothes. The floor is 92” long and 58” wide (37 square feet). This means that you have room at the head, foot, and on both sides. My husband and I slept in the Optic with one lab at our feet, one lab in the side vestibule, and our gear in the front vestibule. Believe it or not, we still had room to spare and were all very comfortable. We've never had this option available, so we were really appreciative! I did not experience rain with a group, but if you were with a group and it rained, you can definitely get four people sitting up comfortably in the tent for playing cards or other similar activities. The Optic pitches nice and tautly. 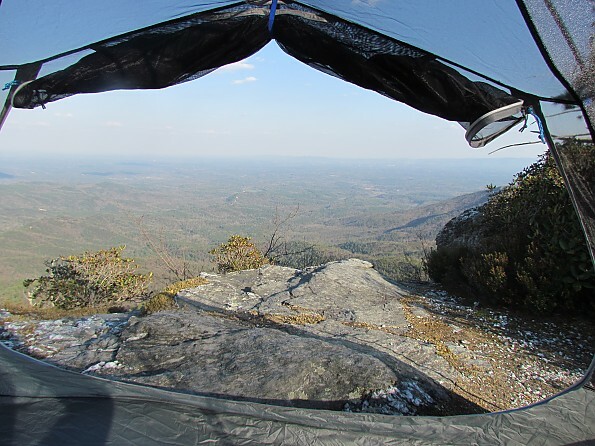 It didn't budge in the 25 MPH winds we encountered on the rim of the Linville Gorge. I was not able to get rained on during any of my testing. If I am able to, I will update this at a later time. I did notice that the Optic has some really nice weatherproofing designs, though. 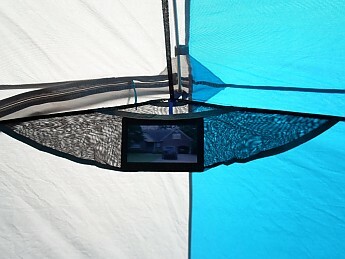 The Optic’s fly pitches very close to the ground, and the bathtub floor is very tall, so you won’t see any rain splashing into the tent. 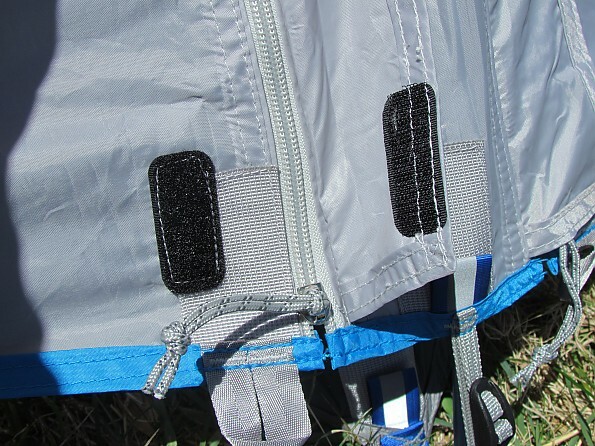 The zippers on the fly are covered with flaps and are velcroed shut at the bottom for extra protection. 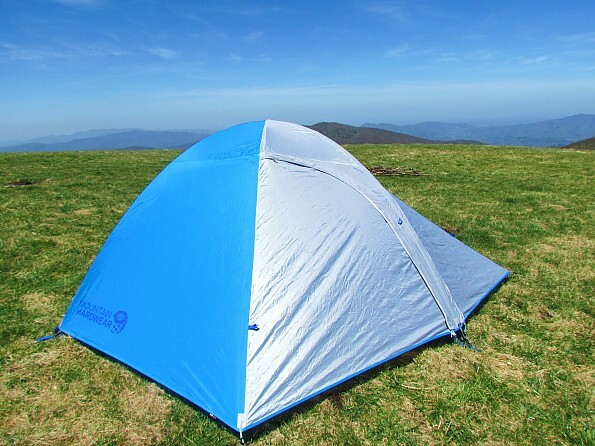 If it were raining and I was to enter the tent, I would suggest entering the side door, because the top pole pushes the fly out so the rain would roll off the sides, instead of entering the tent. Side entry - notice it is covered. 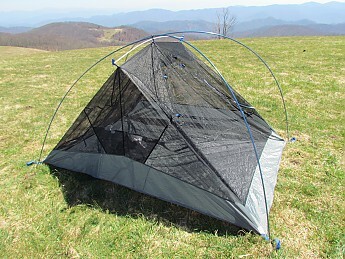 Front entry - front door is angled, so rain would definitely enter the tent if you open the fly. 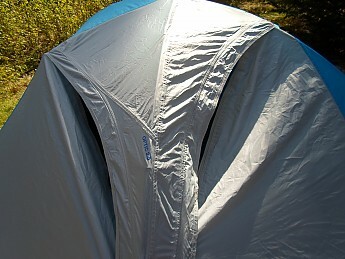 One thing that I found disappointing about the Optic was that there are no external vents on the tent. 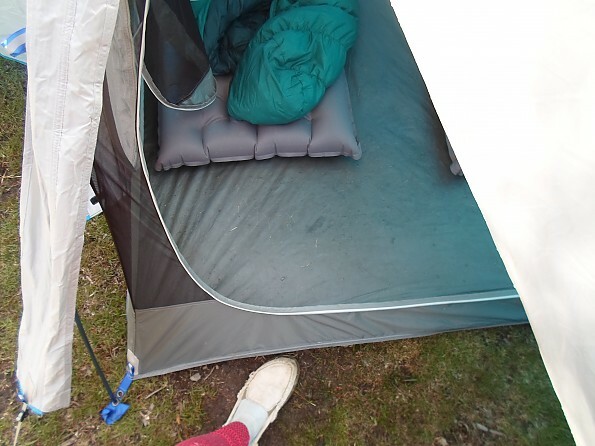 The tent does have three line tensioners at the bottom of the doors, to allow a taller pitch for more venting, but I feel that the venting options are insufficient when the doors must be closed due to inclement weather. The inside of the fly was covered in condensation one morning, because of the poor venting. 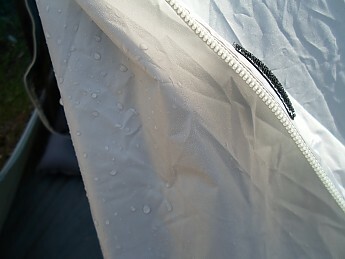 The Optic does have two-way zippers on the fly, so if you know it is not going to rain, you can unzip the top of the fly to allow more airflow. 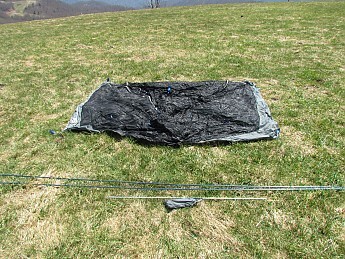 Packability: The Optic is a pretty bulky tent because it uses such heavy fabric on the tent bottom and the fly. The fly takes up the bulk of the room in the bag. 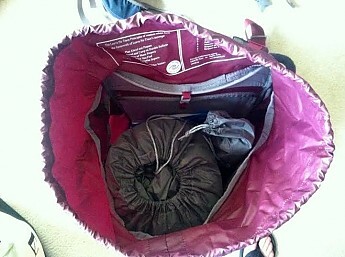 The Optic in my Osprey Aura 50L. 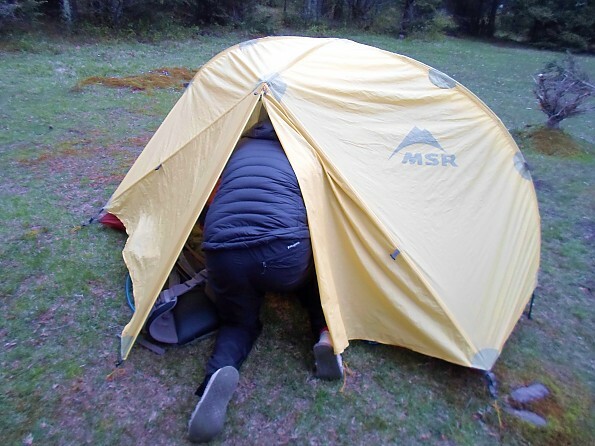 You would most likely want to splurge on an after-market compression sack for this tent, because it takes up a considerable amount of space in your pack. The stuff sack that it comes with does not have compression straps. The fabric on the Optic is very durable. My two labs slept in the tent and walked on the floor. I had no worries about them tearing the floor because the fabric is so burly. We camped on some very rough surfaces, including jagged rock and grass with a lot of tiny broken sticks. The bottom still looks good as new! I am a 5'4" 30-year-old female backpacker from South Carolina. 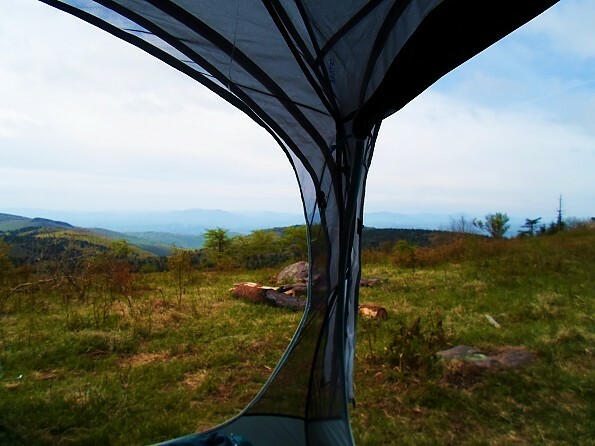 I primarily hike in the southern Appalachian Mountains (mostly in North Carolina). 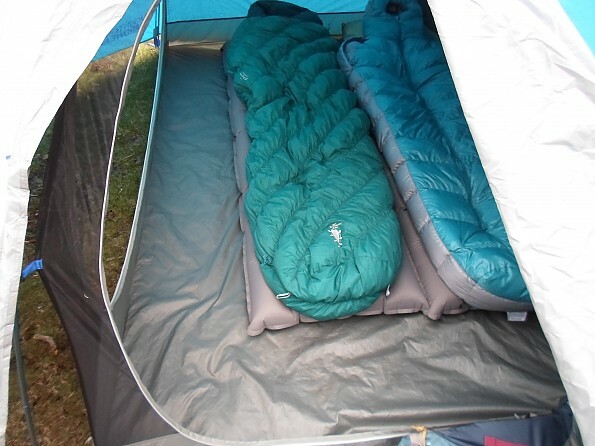 My 5'9" husband and I slept in it on three trips, both sleeping on 20x72x4 Big Agnes Insulated Q-Core pads. 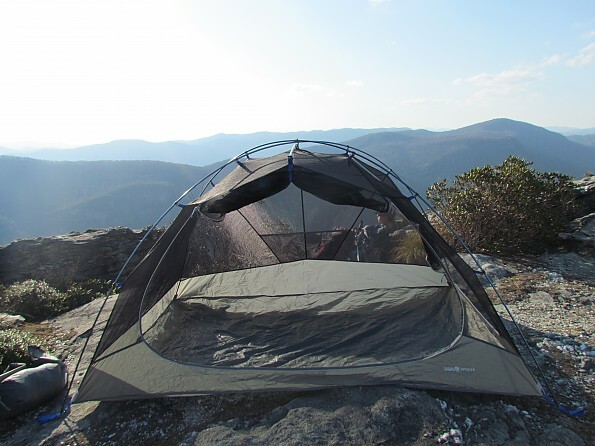 We camped on the rim of the Linville Gorge, on Max Patch Bald, and in Grayson Highlands State Park, Virginia (the latter two are on The Appalachian Trail). Temperatures ranged from 65 degrees to 30 degrees. All three places are beautiful and the Optic provided some unbelievable panoramic views! What I loved: I can’t gush enough about how much I loved all of the space in the Optic. It is easily the most comfortable tent I’ve ever slept in. I also loved how easy it is to get in and out of. 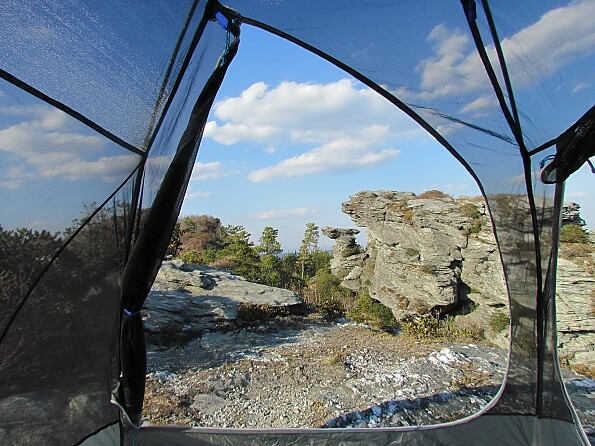 I usually try to pick campsites with a view, so I also really love the Optic’s ability to provide an expansive 180-degree panoramic view. What I didn’t love: I wish that the Optic weighed less (I think the fly and floor materials could be lighter), that it took up less room in the pack, and had external vents. 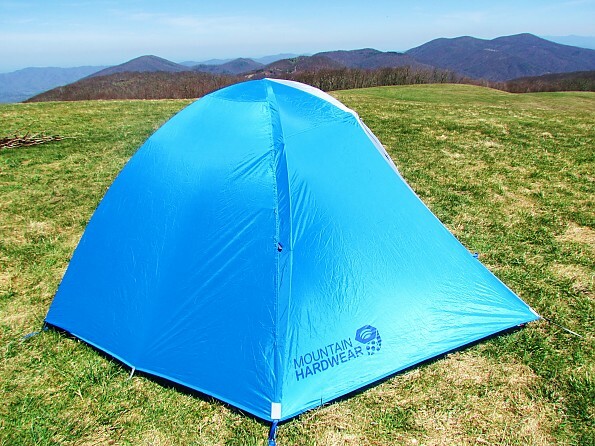 The Mountain Hardwear Optic 2.5 is a high quality hybrid backpacking/car camping tent that is supremely livable and is offered at a great price. 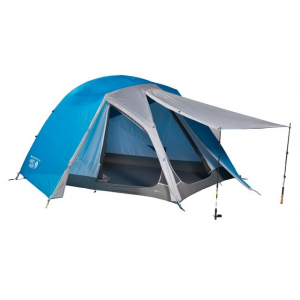 I highly recommend this tent to anyone who is looking for more room in their backpacking tent. The extra space and panoramic views are well worth the extra weight. 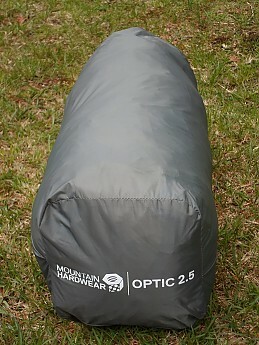 Thank you for taking the time to read my review of the Mountain Hardwear Optic 2.5. 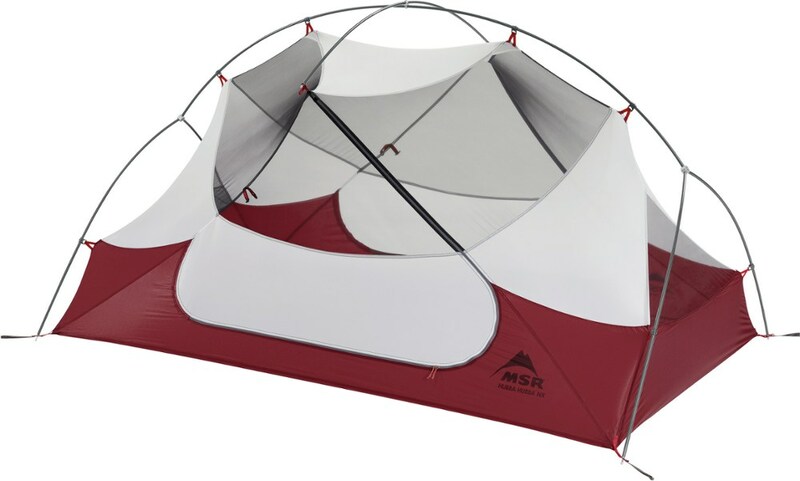 Thank you to Mountain Hardwear and Trailspace for giving me the opportunity to test and review this awesome tent. I've been curious about this tent. Definitely a unique design that lends itself to great viewing opportunities. Very spacious too (our four-legged family member is only 20lbs...but more could be in the future). I like the use of the tablet with the pockets. Great review Ashleigh! Just finished our first weekend with the Optic 3.5. 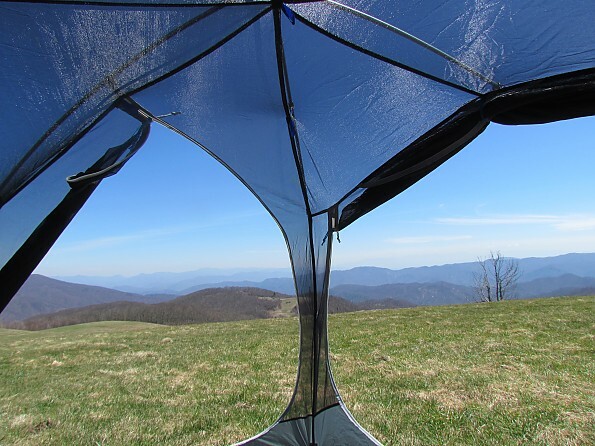 Agreed when it comes to venting and rain protection when entering/exiting the tent. And, YES, the fly could be a LOT less heavy-duty than it is. We had clear skies both nights and ditched the fly. Made packing up camp a lot easier. 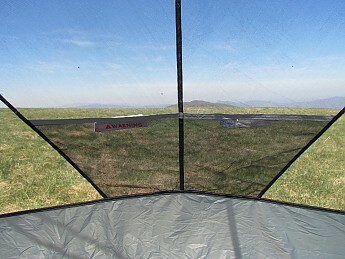 If you can manage the weight, I don't know how many other tents offer this kind of head room and floor space. Plus the large expanses of seam-less mesh mean completely unobstructed views. Saving the rest my thoughts for a review of my own (pending a couple more trips), but glad to see we're much in agreement on this one! Nice work! outstanding review - great photos. i want one! Ashleigh, this was another great review. And I love the views you provide in your pics! 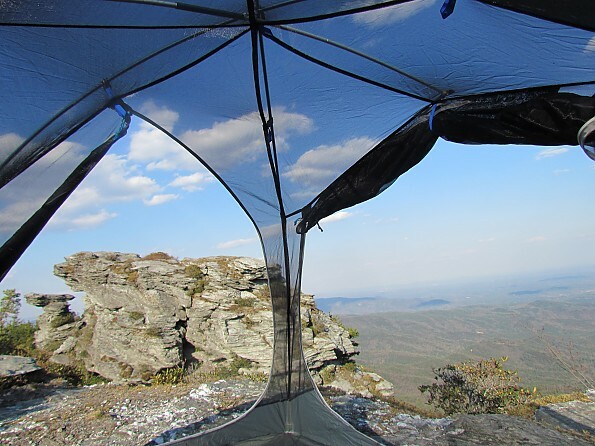 Such great pictures...the staging and views could make the marketing staff at Mountain Hardware drool :) You really demonstrated the roominess of the tent well too. Looks like it would serve as a great basecamp shelter for a couple plus kids and/or dogs. Another stellar review! Another helpful review, Ashleigh! Thanks for sharing it and the pics. Thanks for your review Ashleigh! I think more kid and dog-room in tents is a good trend. cool review. Thank you all for the kind words! @Eric, I am glad you are loving your Optic 3.5. The Optic really is awesome! I am looking forward to seeing your review. @Jeff, I agree! Thanks for the great review! Any update on the potential issue of rain getting into the tent? (One other web review flagged it as a serious issue) And did leaving the zippers a open help with the condensation problem? Also from the limited reviews out there seem like fly ripping could be an issue? I am picking between marmot limelight 3 and optic 3.5.... After adding the price of the footprint(not included in optic series) they r about the same price. Thanks in advance. Thanks, Hardy! I have not been back out in the Optic yet. 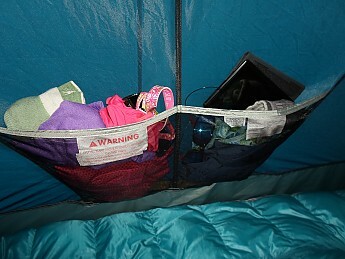 The only issue with rain entering the tent should be if you are entering the front door during a downpour. I think the side door would be perfectly fine. I will update next time I get rained on, though. I did not leave the zippers open during the night when I used it because it was misty and I was afraid that it might start to rain. I think that it would help to unzip them like I demonstrated in the winter when you don't want to take the fly off due to cold. If you think it is going to rain, I would not leave them open. If I felt sure it wasn't going to rain and the weather was nice, I would just completely remove the fly or either roll back one or both of the fly doors. As far as the fly ripping, I can not imagine how that could happen. It is one of the burliest rainflys I've ever seen. 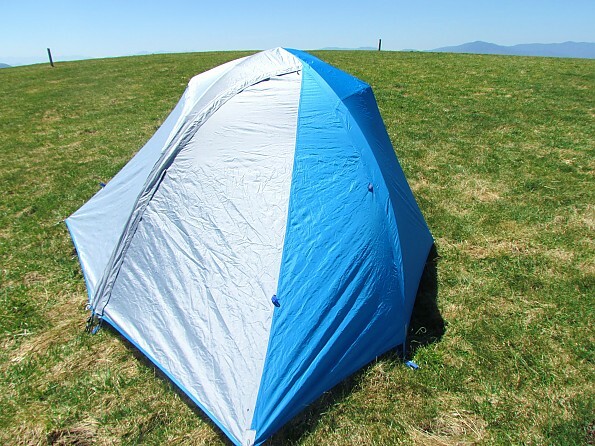 I will also add that I don't think you need a footprint with this tent because the bottom is so strong. That is totally up to you, but I would at least see and feel the floor yourself before purchasing a footprint. I hope this helped! Thanks! 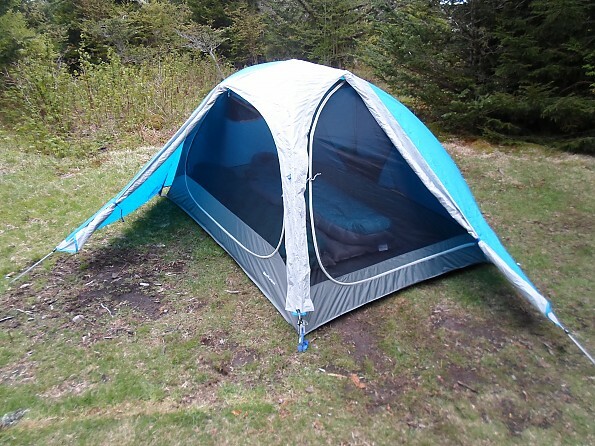 I really like the doors location so I will give the tent a try...and maybe just get tarp instead! Just bought the 3.5 (on sale for 200 @atmosphere in Canada until June 19th if there's any Canadian reading this)and put it up quickly . A few notes- 1. 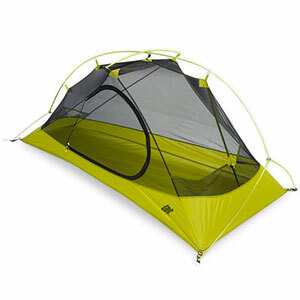 Optic 3.5 has 5 built-in, internal pockets, which make the lack of included gear-loft easier to swallow 2. doors are HUGE, but I think the side door having to be rolled up might be of minor inconvenience 3. not that much bigger than an average 3 person tent, which means fitting 3 people is still gonna be tight. Thanks for the feedback, Hardy! I hope you enjoy it! Thanks for the amazing review, Ashleigh! By far the most through review I've read! This really helped me decide between a few tents I was looking at. 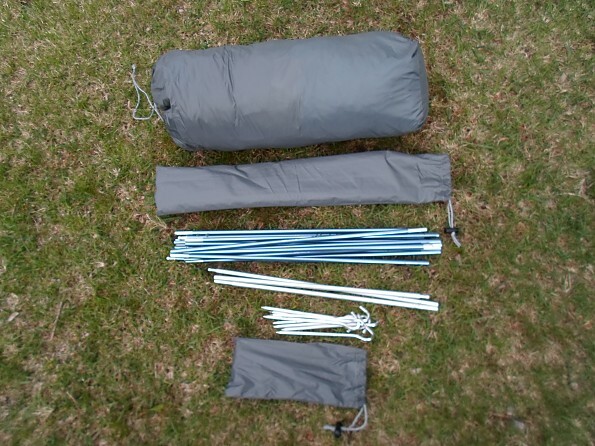 I was wondering if you had any recommendations on compression sacks for this tent. 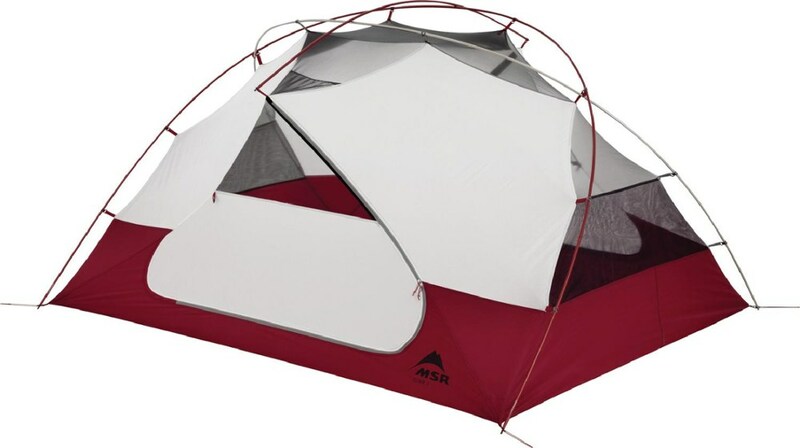 I'm new to backcountry/portaging camping so I'm at a lost on how much I can compress a tent (without damaging it) and what type of compression sack I should be looking for. Thanks in advance :).